All roads lead to Rome, and all roads in the Eternal City itself lead to a delicious meal. In Rome: The Urban Kitchen, Katie and Giancarlo Caldesi unearth the city's hidden gems - centuries-old recipes that have been handed down through the generations, as well as new, exciting dishes inspired by Romans from all walks of life. The duo present their interpretations of classic dishes, like Katie's Cacio e Pepe (spicy cheese and pepper pasta), alongside family favorites like Spigola in Saltimbocca (seabass with parma ham and sage leaves). Collaborating with Rome's best chefs, they also share modern Italian recipes - like Sorbetto di Peperone, a fiery hot chilli sorbet - that reflect the heat and color of this bustling city This is an impressive, fresh look at Rome's cuisine that will be sure to inspire. 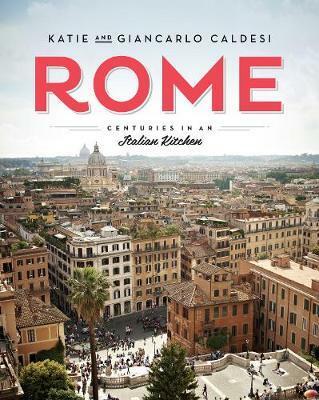 As well as all the tantalizing recipes, Katie and Giancarlo take readers on a sumptuous, visual journey, from the Pantheon and Colosseum, to the Renaissance palazzos, Baroque fountains, and neighborhood trattorias. Complemented by Katie's anecdotes of their trip, Rome: The Urban Kitchen is a beautiful cookbook and keepsake that will transport you to the heart of Italy.